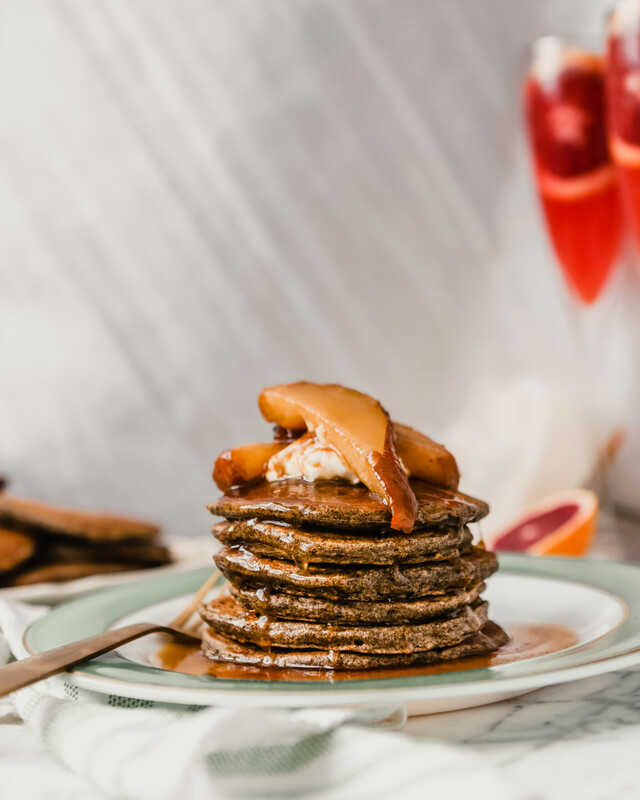 Buckwheat pancakes are my new go-to breakfast and brunch recipe. 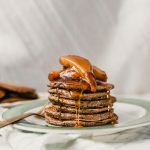 These fluffy pancakes are made with oats and buttermilk, are naturally sweetened (no refined sugar!) and absolutely delicious. Did I mention they’re pretty darn easy to whip up too? 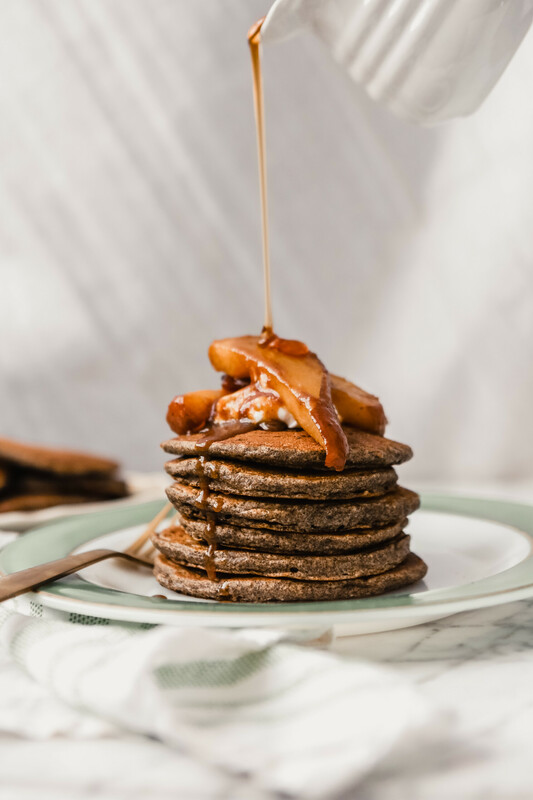 This modern, healthified take on the classic pancake recipe will redefine your opinion of pancakes. Don’t suffer through bland, flat pancakes any longer. Save some sought after cupboard real estate by ditching the boxed mix and opting for this homemade version that’s made with clean, whole ingredients and warm spices. 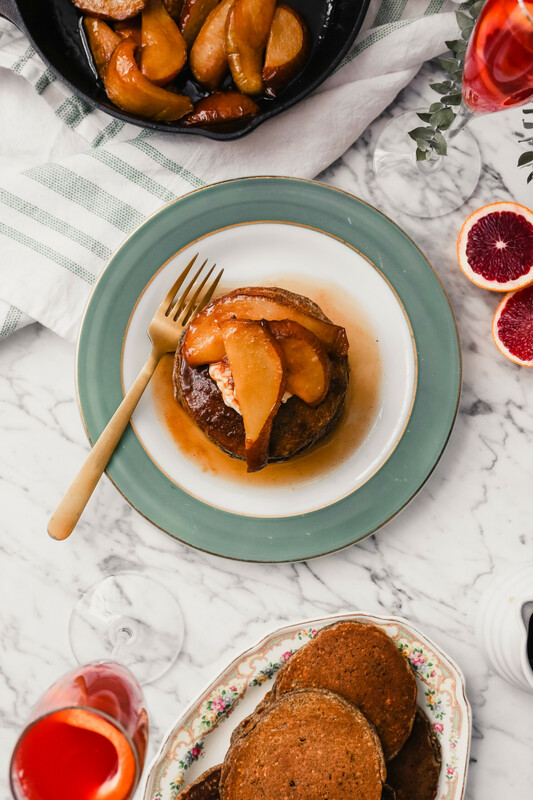 Plus, you can’t go wrong with the caramelized spiced pears either. These pancakes are gluten-free! If you or someone you’re cooking for follows a gluten-free diet, be sure to use certified gluten-free oats. In general, oats are always gluten-free, it just comes down to whether or not they were processed in a plant that also processes foods that contain gluten. So if it’s a serious allergy, make sure your oats are certified gluten-free. Can buckwheat pancakes be frozen? These pancakes freeze wonderfully, which makes them a great addition to your weekly meal prep. Right before you head out the door, pop a few in the toaster, spread on some almond butter, and top with a few apple slices or strawberries. Breakfast is served! Can you make Blini with this batter? Blini are mini buckwheat pancakes (usually made with a yeasted-batter) hailing from Russia. Typically served with sour cream and caviar or smoked salmon, blini are a classic no-fuss appetizer. Although blini batter is usually made with yeast and buckwheat flour only, this modernized version relies on baking soda and powder as the leaveners and a bit of oat flour to create a light and fluffy pancake. To cook blini, use 1 tablespoon of batter at a time and cook over medium-low heat for 1–2 minutes per side. These pancakes are definitely healthier than most packaged mixes. Per two 4-inch pancakes, they have less calories, carbs and sodium and more fiber and protein than packaged varieties. Plus, they’re free of refined sugars and grains and only use whole, clean ingredients. 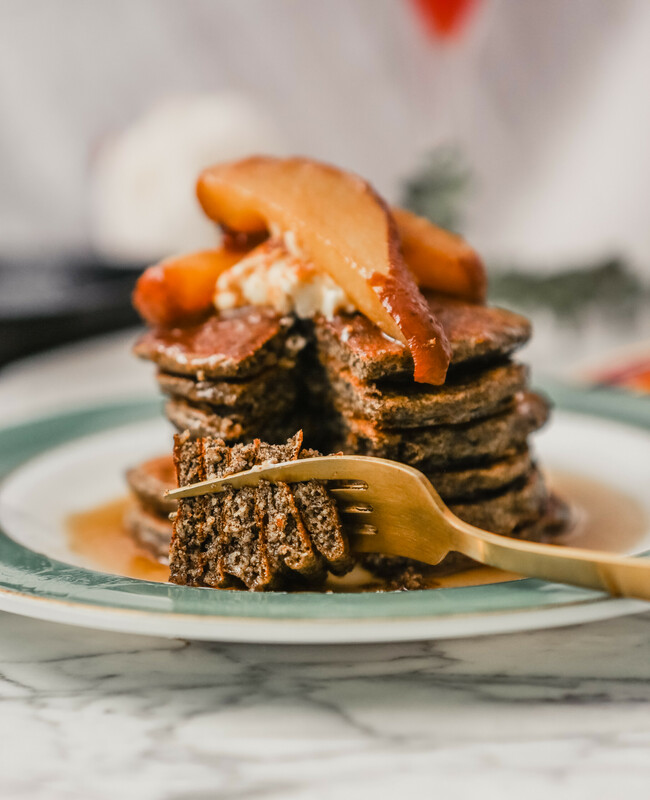 How do you make buckwheat pancakes taste good? The key to making buckwheat pancakes and waffles flavorful lies in using spices. Using a variety of warm spices and a splash of vanilla extract will greatly enhance these tender flapjacks. You know I love cardamom, but nutmeg and cinnamon also add a ton to the party. If you’re an allspice or ginger lover, add those. Use what you like, just be sure to add some spices! Using pure maple syrup is also key. The fake stuff just doesn’t compare. And to be completely blunt, if there’s one thing in your kitchen I would throw away right now, it would be fake maple syrup. It’s c.o.r.n syrup. NOT maple syrup. Get rid of it. Lastly, top them with some fresh fruit (berries, sautéed apples or pears, clementines), nut butter, coconut butter or straight up buttah—yum! 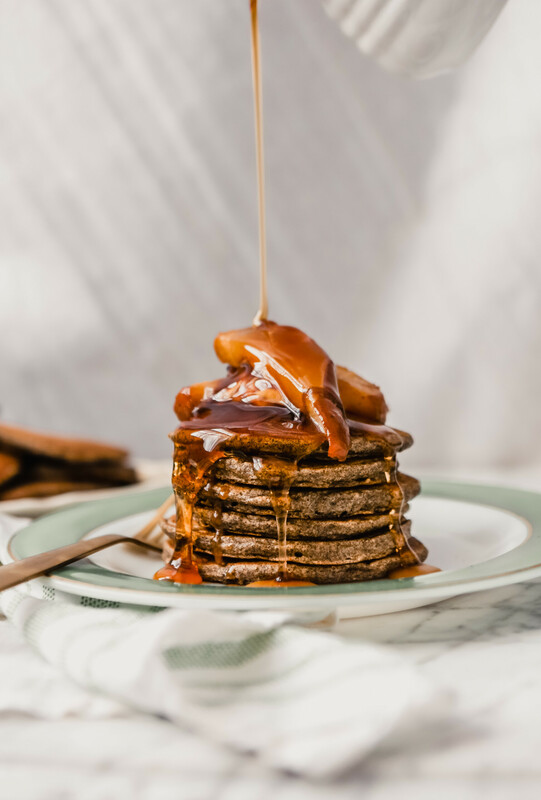 Can you make these buckwheat pancakes vegan? 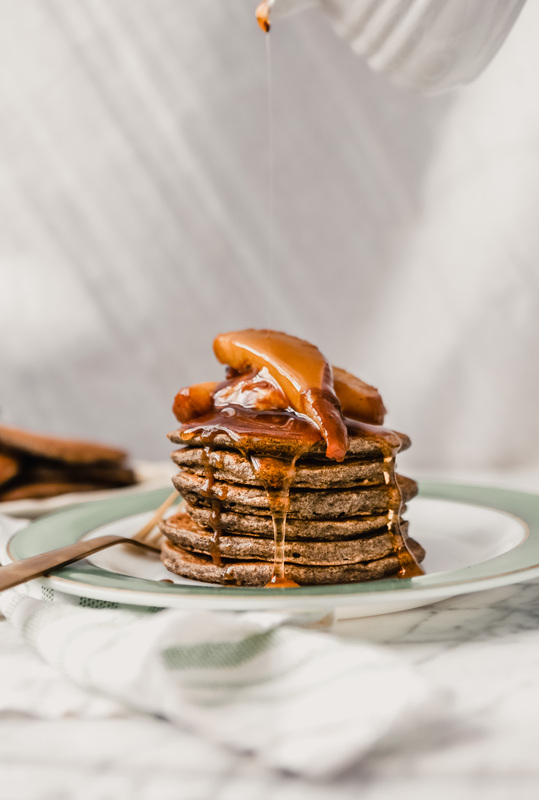 If you follow a vegan diet, no worries, you can still enjoy these pancakes! Swap the buttermilk for vegan buttermilk. Combine 1 cup unsweetened almond or soy milk with 1 tablespoon vinegar. Let the mixture rest for 5–10 minutes until curdled. Swap the egg for a flax or chia egg. Grind 1 tablespoon flax or chia seeds in a spice grinder. Combine ground flax or chia with 3 tablespoons water and let rest 15 minutes in the refrigerator. 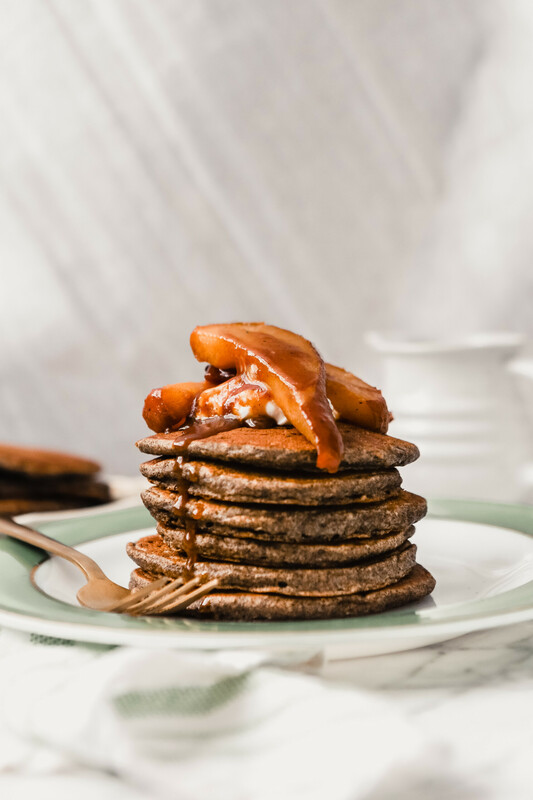 These buckwheat pancakes are delicious topped with the caramelized pears listed in the recipe. However, to make them seasonal, serve them with whatever fruit is in season. Depending on the time of year, fresh berries are always a great option. If you’re looking for something a little more decadent you can stir in some mini chocolate chips or top with your favorite nut butter. 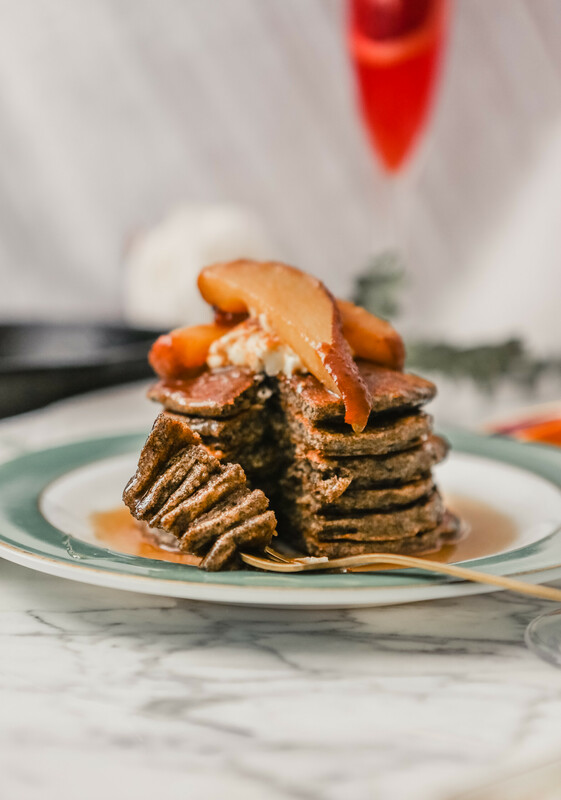 These buckwheat pancakes are featured in my Winter Pancake Brunch Menu alongside a blood orange mimosa that couldn’t get any more gorgeous or easy to make! In a large bowl, whisk together buckwheat flour, oat flour, baking powder, baking soda, cinnamon, salt, cardamom and nutmeg. In a separate bowl, whisk together buttermilk, egg, sugar, and vanilla. Whisk buttermilk mixture into flour mixture until combined; let rest 20 minutes. Heat oven to 200°F. Set a rack inside a baking sheet and set in oven. 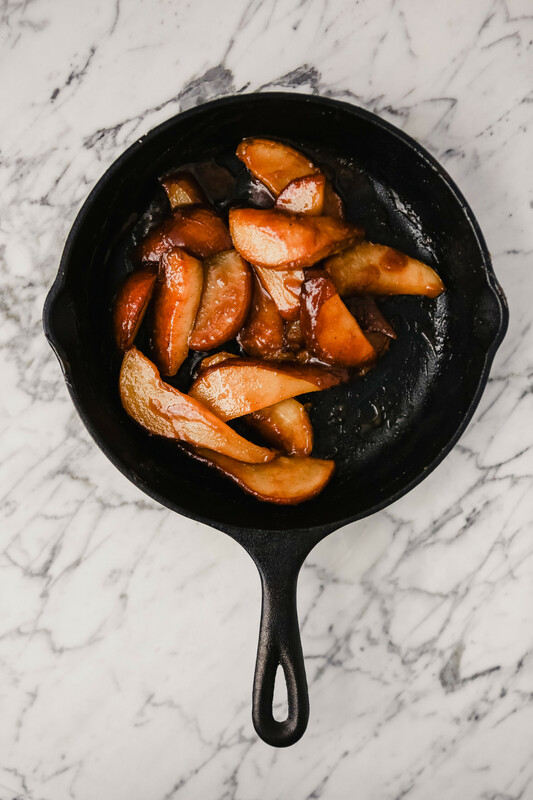 Meanwhile for the pears, melt butter over medium-high heat in a large nonstick or cast-iron skillet. Add pears in a single layer and cook, without flipping, until browned, 4 minutes. Flip pears, reduce heat to medium and cook until starting to brown, about 4 minutes. Add maple syrup, ginger, cinnamon, nutmeg and salt and cook, stirring occasionally, until sauce has thickened, 2–3 minutes. Off heat, stir in vanilla. Heat griddle or cast-iron skillet over medium heat for 5 minutes. Decrease heat to medium-low and coat with nonstick spray. Using a ¼-cup measure, scoop batter onto griddle and cook until edges are set, bottoms are golden brown, and bubbles on surface burst and don’t fill in, 2–2½ minutes, flip and cook until golden brown, 1½–2 minutes. 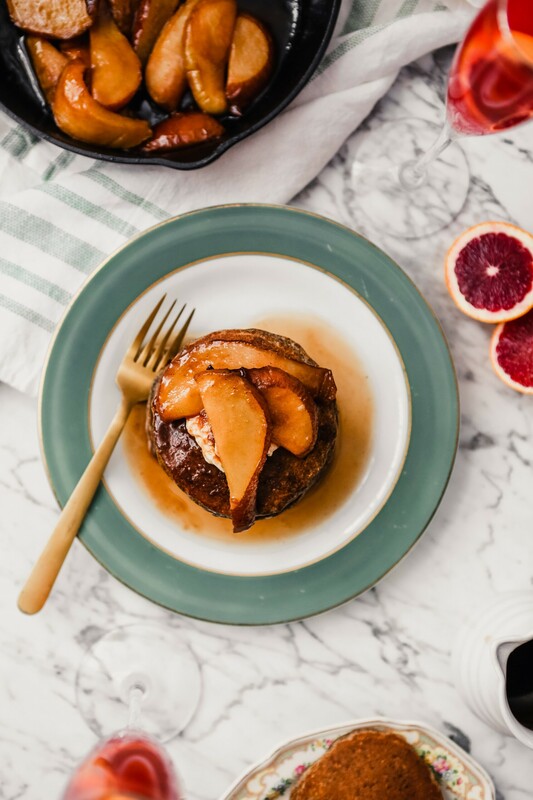 Serve pancakes immediately with caramelized pears, yogurt (if using) and pure maple syrup, or transfer to wire rack in oven to keep warm. Repeat cooking with remaining batter.